World-leading ignition and sensor manufacturer NGK SPARK PLUG EUROPE has launched the aftermarket’s most extensive selection of premium engine speed and position sensors at Automechanika Frankfurt, making its NTK Vehicle Electronics brand a complete, one-stop shop for replacement sensors. Opening up extra OE replacement opportunities for aftermarket customers, the new programme marks a further expansion of the NTK sensors portfolio following the introduction of its mass air flow (MAF), manifold absolute pressure (MAP) and boost pressure sensor ranges at Automechanika 2016. 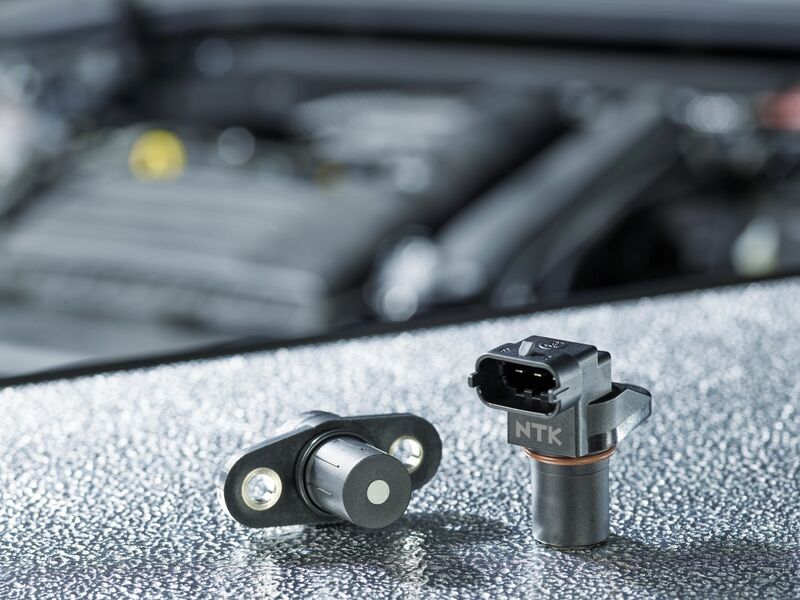 With other NTK product groups already including oxygen sensors, exhaust gas temperature sensors and NOx sensors, the latest addition builds NTK’s standing as the complete solution for engine sensors. Connected to the pistons and the gearbox, the crankshaft converts the linear, vertical movements of the pistons into rotary motion that powers the engine and makes the vehicle move. The (crankshaft) speed sensor keeps track of this rotational speed, as well as the crankshaft position of it. The purpose of the camshaft is to open and close the valves. It is connected to, and driven by, the crankshaft and rotates at half of the crankshaft’s speed. The (camshaft) position sensor continually measures the location of the camshaft to ensure appropriate synchronisation. Both of these sensor signals are used by the ECU to determine which cylinder is currently in its power stroke. From this the ECU determines precisely when to inject fuel, and when to apply voltage to the ignition coil for perfectly timed spark plug operation and smooth engine control. The importance of engine speed and position sensors to vehicle operation therefore makes selecting a quality supplier even more important. The new NTK engine speed and position range includes 567 part numbers covering 88% of the car parc, equivalent to 270 million cars in Europe. This makes NTK Vehicle Electronics the first premium brand to provide an exceptional quality, long-lifespan replacement engine speed and position sensor for almost every vehicle application. Types include both inductive-type sensors, which generate an analogue signal, and Hall Effect sensors, which output a digital signal. The full programme has been engineered to improve original parts deficiencies. All parts are tested to extreme, in particular with thermal shocks ranging from -25°C to +135°C, in order to provide the best products to the market. In other design features, each NTK engine speed and position sensor is completely sealed to prevent leaks and ensure a long product life, whilst sealed connections prevent environmental corrosion and performance issues. Easy-reference part numbers, eye-catching NTK-branded packaging and double-sided labelling all aid distributor stocking. The sensors are safely protected in a sealed, transparent plastic bag for easy inspection. Precise sensor alignment, positioning and spacing – as well as clear fitting instructions – also ensure fast, easy installation. All of the new engine speed and position sensors are available immediately and are listed in the major electronic catalogues such as TecDoc. In addition, for the first time, three NTK catalogues have been produced to reflect its complete, expanded 2018-19 sensors portfolio: Engine Speed & Position Sensors, MAP/MAF and EGTS & Oxygen Sensors. Each catalogue is available in 13 languages, in print format and as a PDF download from NGK SPARK PLUG’s website. A technical video is available at on the company’s YouTube channel by scanning the QR code on the pack, and dedicated technical training is being offered to end-customers on request.